Where: 4123 State Street, (805) 683-3074, palaparestaurant.com. What: Traditional Mexican recipes for breakfast, lunch, and dinner. How Much: Lunch specials $8-$9.25, supreme wet Palapa burrito $9.75. The Dish: Mexican-flag toothpicks decorate ample-plated portions of authentic south-of-the-border cuisine at Palapa. Craving a breakfast burrito stuffed with scrambled eggs? Or two midday beef flautas? Then Palapa has your breakfast and lunch covered. The most popular evening burrito is served wet with your choice of more than 10 meat and vegetarian entrées, including a zesty chile verde. Dine between 11 a.m. and 2 p.m. and take your pick from an array of lunch specials, served with two sides and guacamole. A lunchtime highlight is grilled sole tacos alongside flavorful “green rice” with cilantro and poblano chiles. During dinner, try the overflowing seafood platter if you’ve got a group big enough to wolf down the hot prawns, fish, octopus, and other nicely spiced seafood delicacies. 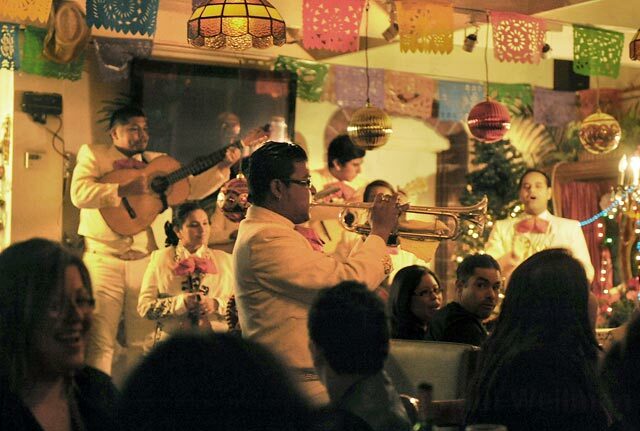 Stop by for Happy Hour during the week from 3-6 p.m. and live mariachi music Fridays 6-9 p.m.